Happy 20th anniversary "Wigs.com - The Wig Experts"! We have you to thank for making this milestone possible. Thank you for 20 Years! Over the years we've been inspired by uplifting stories of bravery, and fun stories of fabulous hair. The "One Women's Story" video series is introduced to share these inspirational messages with our community. Watch more stories! Hair loss affects so many of us - but is different for everyone. The Hair MatchMaker tool is introduced to help clients find just the right wearable hair solutions for them. The Ellen Wille brand of couture wigs and hairpieces is introduced, exclusively at Wigs.com. 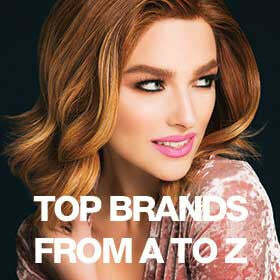 Europe's top wig brand is now one of the most popular brands here in the US! Shop all Ellen Wille Wigs. Wigs.com gets a new look, cool new features and an overall better shopping experience. Wigs.com is featured in an American Express commercial, part of the "Inside Successful Small Business" series, providing a great opportunity to share all the hard work and passion that goes into what we do. Facebook, YouTube, Blog, Twitter, Pinterest just a few of the ways we get to connect with our amazing community. Thanks for all the feedback, comments and photos you share! TruColor is introduced to make it easier to select shades online. We are the first to present photos of the complete styles in ALL colors available (instead of just swatch), making it easier to choose color with confidence! Ready-to-wear lace front wigs are introduced by Jon Renau with the SmartLace Collection and Raquel Welch with the Sheer Indulgence Lace Front Collection. The first BeautiMark was such a hit, we create a new line specifically formulated for human hair called Pure Care. We know choosing a wig online can be tricky. With the creation of our own in-house production studio, its possible to constantly add exclusive images and videos. And with so many videos, we create our own YouTube channel "WigsTV". After many hours in the lab, the formula is perfected and the BeautiMark collection for synthetic hair is introduced. 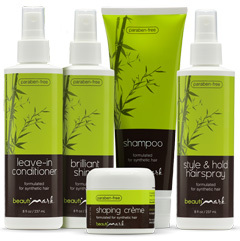 In our humble opinion, BeautiMark remains the absolute best hair care product available for alternative hair. 2006 | There's no place like . . .
. . . Kansas City! We wanted to be able to ship your wigs even faster, so we moved our warehouse next door to the largest wig manufacturer in the US "HairUWear". With such a central shipping facility, our clients receive their orders faster than ever before. For the third year in a row, Beauty & Hair (parent company to Wigs.com) is ranked among the top 100 fastest growing companies by the Dallas Business Journal. Wow, the first ten years really flew by! We celebrate 10 years online and business is better than ever. Wigs.com continues to grow. We add new products, brands and content. Ten years in business and still going strong! Growth to be proud of but not enough space! It is time to move our corporate headquarters in Dallas, TX to a larger office, just in time for our ten year anniversary. Beauty & Hair Products International is introduced as the parent company for Wigs.com, as well as HairExtensions.com, Hairpieces.com and WigOutlet.com, which are also part of the Beauty & Hair network of e-commerce sites. Visit BeautyandHair.com for more information! Widely regarded as one of the worlds most iconic film stars, Raquel Welch seizes the limelight again with her first collection of wigs. She is now known as one of the true pioneers in contemporary wigs, and the brand is more popular than ever. After years in the alternative hair business, founders John & Stella Reynolds introduce the first Jon Renau collection of wigs at Wigs.com. 20 years later, Jon Renau is still one of our top brands. Back in November 1995 it was a leap of faith! It all begins with a small team in a one room office with our focus set on providing a pampering experience for the client. We weren't positive that women would feel comfortable shopping for wigs online, but now we ship thousands of orders every month. That's a lot of wigs!